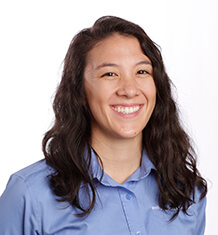 Samantha received her Bachelors of Science in Exercise Science from California Lutheran University and her Doctorate of Physical Therapy from Duke University. After graduation, she decided she wanted to be back on the west coast and after an enjoyable clinical internship in the SeaTac area chose to return to the Pacific Northwest. She joined MTI in August 2016 as a resident physical therapist and will pursue further training through the Ola Grimsby Institute’s manual therapy residency program. Samantha chose to pursue physical therapy after developing a keen interest of human movement through her many years of playing competitive soccer. As well, after going through physical therapy herself for a soccer related injury, she loved the idea of helping others get back on their feet after their own injuries. It’s no surprise that her interests lie in sports and orthopedic physical therapy. After a physical therapy mission trip to Jamaica, Samantha is also excited to further explore the role of physical therapy in global health. In her free time, Samantha enjoys playing soccer, standup paddle boarding, exploring the local landscape and everything else the PNW has to offer. Hebert, O., Schlueter, K., Hornsby, M., Van Gorder, S., Snodgrass, S., Cook, C. (2015) The diagnostic credibility of Second Impact Syndrome: A systematic literature review. Journal of Science and Medicine in Sport.